Hello! Today's card was a pretty quick and easy one. Bonus I LOVE how it turned out! So much so that I made two exactly the same except for the sentiment. I heat embossed the PSX wreath and colored in the berries with my copics. Added a pretty double bow and added a sentiment (heat embossed also) an that was it. That wood panel DP really helped make the card I think?? I hope AC Moore's still carries it because I need to get few more sheets for future use! Challenges I'm entering are listed below. Hope to have more cards this weekend! I love how it turned out too Janice! The berry wreath is awesome and looks fabulous against the wood grain. I really like the bow you added... the tartan ribbon looks great. The sentiment finishes it off nicely. 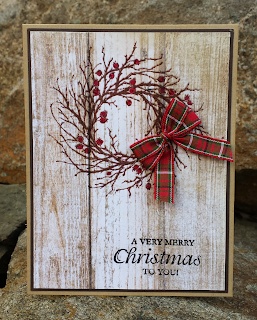 This is such a beautiful card, I love teh design and the fabulous paper too. Thank you for sharing with us at the Ribbon Girl, good luck and I hope you will join us again. what stamp sets did you use? Love the card and would like to remake? Where did you find this wreath stamp? It's beautiful!! i love the look of this card too but i'm confused by some of your terminology. What is "DP" and what is "PSX". thanks for your help and perhaps i can recreate it also. PSX stands for Personal Stamp Exchange, a Stamp company that used to have such beautiful stamps. I just Googled them, and apparently they were bought by Inkadinkadoo, who reportedly still makes some of their designs. The best place to find their stamps is eBay. I believe DP stands for designer paper, but I may be wrong. Hope this helps!